When my kids outgrow a piece of clothing that I have memories attached to, I have a difficult time parting with it. I set it aside and try to think of something that I can make with it. Enter my idea for a crazy quilt Christmas tree skirt. I began this about 8 years ago. I work on it a bit every year. It's to the point that it is usable under the tree. I'd still like to do the characteristic embroidery over the seams that you find in crazy quilts. And after I finish that, I'll sew the backing on. There's a method for crazy quilting called flip and sew. 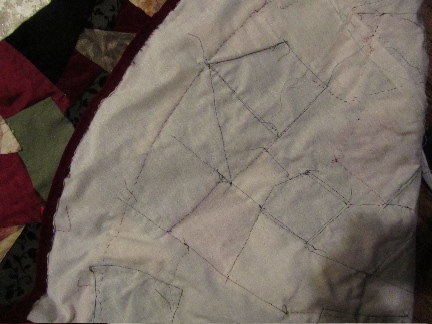 Basically, you have a backing piece, turn your quilt patch right side down, stitch one edge, then flip over. Now, take another quilt patch, place it on top of the first sewn patch, with right sides together (and so the new patch is right side down), and stitch through both the new and old patches and the backing fabric, along one edge. Now flip this one over as well. Not all crazy quilters use a backing piece. I found it helpful to use one to help guide my shaped skirt and give strength to the whole piece. I used sectioned backing pieces for my tree skirt, 4 wedge-shaped sections. I did the flip and sew technique on each of 4 sections. Then sewed the sections together, covering each seam with more patching. For fabric, I used some old clothing items (a couple of Christmas dresses from my girls, what can I say, I am a sentimental fool), a dress bought at Value Village on 50% off day (spent about $3.50 for about 2 yards of usable velvet), some upholstery fabric (more difficult to sew with as it has a heavy backing to it), and a couple of bought remnant pieces. The backing pieces, to which I sewed the quilt patches, are from a set of curtains I made 25 years ago. I did buy new thread, however, so that any thread showing would be the right color. This has been my first attempt at crazy quilting. I'll definitely do other pieces. It was that easy, forgiving and fun. If you'd like to "see" this flip and sew technique, here's a one page explanation with photos to give you a good idea of how it all comes together -- www.whatifitry.com. All of the quilts I grew up with were crazy quilts made from old clothing. 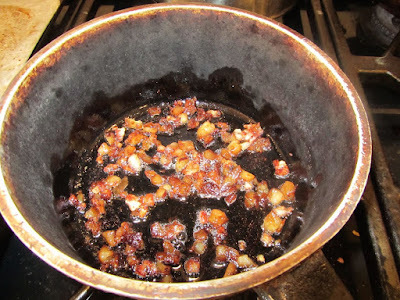 That's the way my grandmother learned to do it because that was what they had to work with. New fabric was expensive. The tree skirt looks great and it must be as much fun looking at it as it is looking at the ornaments every year with all of the memories associated with them. I only knew crazy quilts from antique and vintage shops I had visited. I had always loved their look. So, making this was something of a thrill for me. 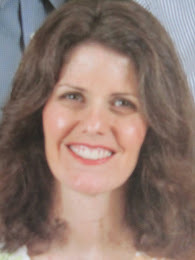 And yes, I love looking at it and seeing my daughters' outgrown, black velvet jumpers, a couple of children's Christmas dresses, and an old brocade vest of mine that I loved (got a tear in it). Call me a sentimental fool! It has a very random, eclectic look to it that I love. That is gorgeous. I have always looked at the crazy quilts and thought they looked too complicated to try, but now that you have explained it I think I could do this too! I've now done both geometric patchwork and crazy quilting, and I think crazy quilts are easier. If you goof and the seam isn't exactly lined up it doesn't matter at all. Plus it can use up all sorts of odd bits and irregular shaped pieces of fabric. Good luck if you try it. I would love to see what you come up with. Your projects are always inspiring. Lovely! And what a great way to save fabric that you love! I broke down and bought a new tree skirt last year. It's a white fleecy felt with cardinals appliqued on it. However, it's now my cat's favorite napping place so what was once white is now covered with cat fur (NOT white!). Your tree skirt is beautiful AND more practical! Too funny! Isn't that how it always is. Your cat or long-haired dog will find the piece of upholstered furniture (or tree skirt, in your case) that their shed fur will most show up on! We always had black cats in our house, and they LOVED the off-white velvet sofa. One of my regular jobs was to use some balled up tape to de-fur the sofa each week. Love it! So pretty! I especially like that you re-purposed used clothing! Thank you. And I love that aspect, too, that I was able to "save" some fabric from clothing that held memories. Hi! 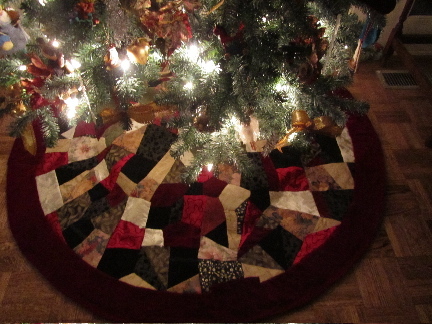 I love the crazy quilt look - even better as a Christmas tree skirt! Me too! They remind me of something you'd find tucked away in a trunk, in your grandmother's attic. Thanks for stopping by.